Bank@Post - Dnister Ukrainian Credit Co-operative. With facilities at over 3,200 Australia Post Retail Outlets around the nation, Bank@Post is available wherever you see the Bank@Post sign. With accessible locations right across Australia, it’s now more convenient to make deposits into your Dnister account. 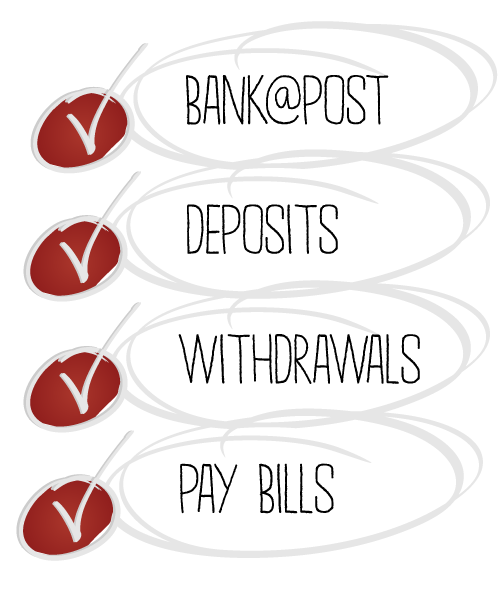 An everyday banking account linked with a Cuecard is required to use Bank@Post. Click here to find out about Everyday Banking products. Present your Cuecard and tell the Australia Post staff that you would like to make a Bank@Post transaction. Swipe your card and enter your PIN to begin. 2 Unlimited number of cheque deposits. Allow 3-5 business days for cheque clearance. Bank@Post™ and its device mark are trademarks (registered or otherwise) of the Australian Postal Corporation. All rights reserved.